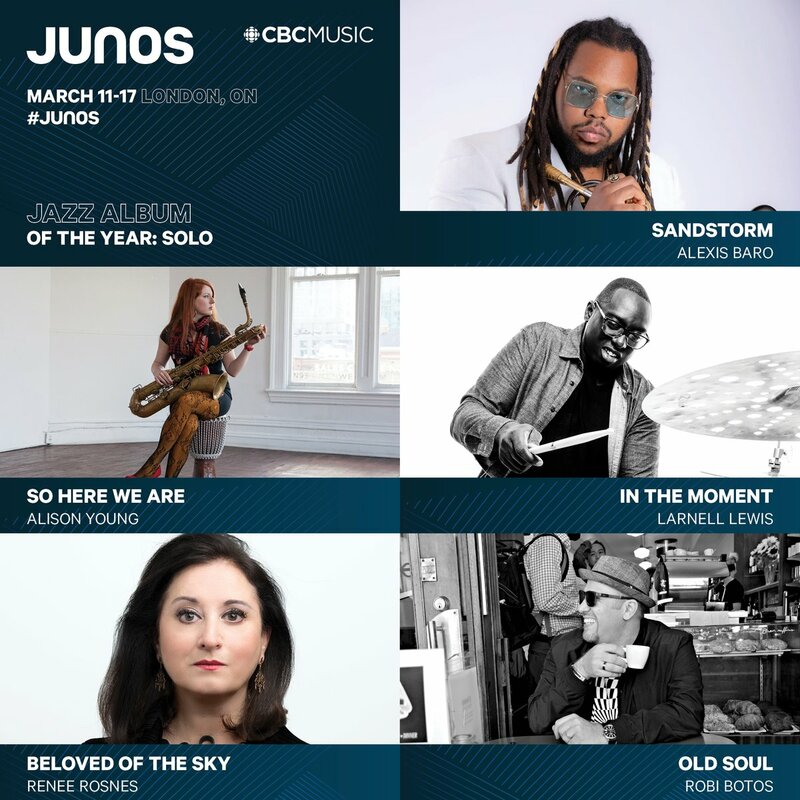 The nominations for the 2019 Juno Awards have been announced, and Orange Grove Publicity is thrilled that three of our clients are up for awards this year! Congratulations to Allison Au and The Liebman/Murley Quartet for their nominations for Jazz Album of the Year (Group); and to Robi Botos for his nomination for Jazz Album of the Year (Solo). 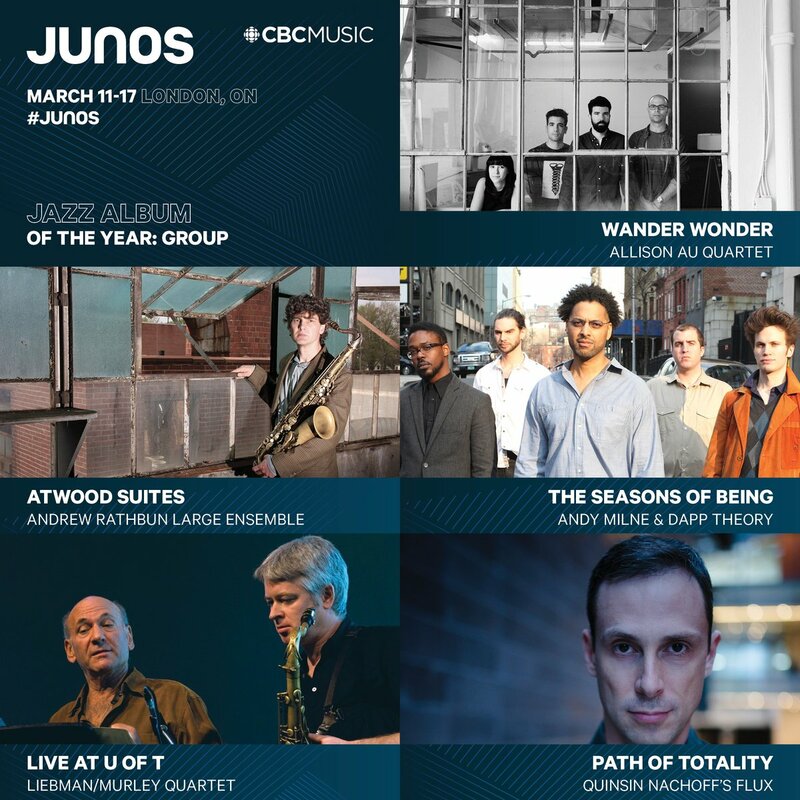 The JUNO Awards will be held on Saturday, March 16th and Sunday, March 17th in London, ON. Congratulations to Allison, Mike, Dave and Robi! Following on the heels of the 2016 JUNO Award win for ‘Best Jazz Album of the Year: Group’ for Forest Grove, The Allison Au Quartet releases a highly anticipated third studio album Wander Wonder. The culmination of an incredibly busy 2017 that saw the ensemble scoop up both the 2017 TD Grand Prix de Jazz (Festival International de Jazz de Montréal) and the 2017 Sting Ray Rising Star Award (Halifax Jazz Festival), Wander Wonder highlights Au’s maturation as a composer while continuing to showcase the strengths of her long-time musical collaborators. Wander Wonder opens with ‘The Valley,’ a lush sonic amuse-bouche that features keyboardist Todd Pentney front and centre on the Prophet Rev2 while the other band mates attentively weave in and out of the background. The following track, ‘Future Self,’ begins with a hypnotic vamp that eventually blossoms into Au’s angular melodic statements on the saxophone. ‘The Rest Is Up To You’ is an amalgamation of influences; a sort of Wayne Shorter-esque composition that also draws much inspiration from Brazilian pop music of the ‘70s. ‘Looking Up’ showcases some of Au’s strongest penmanship as a composer as it highlights the ensemble’s ability to transition seamlessly between rich contrasting sections. The pensive ballad, ‘Morning,’ establishes an atmosphere of repose and calm as the instruments are slowly, yet thoughtfully layered in. The album continues with ‘The Lie That Saves Us All’, a contemporary swing tune of changing meter and harmonic textures. ‘Red Herring’ emerges as an exploration of asymmetric melodies and equally jagged counterparts deftly executed by the rhythm section. ‘Grounds’ serves as an eloquent interlude to the robust exposition ‘Force Majeure’ that showcases Ragnelli’s apt drumming sensibility in a concluding solo. ‘A Trick of the Moonlight’ is a fitting finale; an introspective ballad that draws inspiration from a novel by British author Zadie Smith. Saxophonists Dave Liebman and Mike Murley have performed together for more than a decade, previously releasing Day and Night on Cornerstone Records. Their second release, Live at U of T, featuring bassist Jim Vivian and drummer Terry Clarke, came about as a result of Liebman’s appointment as Visiting Adjunct Professor at the University of Toronto, Faculty of Music. Recorded in a small concert space packed with attentive listeners, Live at U of T captures the spirit and spontaneity of live jazz in an intimate setting. The natural rapport between the musicians on this recording is immediately apparent. Murley studied with Liebman in the 1980s at the Banff Jazz Workshop and in New York City. He and Vivian have worked frequently with Liebman over the years, primarily in the Toronto area but also at recording sessions and concerts in Halifax and Montreal. Drummer Terry Clarke and Liebman are both veterans of the international jazz scene dating back to the late 1960s and their musical chemistry was instantaneous. Old Soul is the much-anticipated 3rd album from Canada’s most talked about pianist, Robi Botos. Following up on his Juno-nominated album, Movin’ Forward, this new album tackles some more personal, and funky material from Botos. The band features a core quartet of some of the top musicians in North America; Seamus Blake on Saxophones and EWI, Mike Downes on Acoustic and Electric Bass and Larnell Lewis on Drums. The album also features some incredible special guests; Corey Henry on Hammond B3 Organ, Ingrid Jensen on Trumpet, Lionel Loueke on Guitar as well as a string quartet on 2 pieces. Inspired by lost friends, past hometowns, and the incredible life-story that has shaped Botos, Old Soul is an album of hopeful, humble and funky music that is sure to thrill jazz and non-jazz fans! The Allison Au Quartet, led by the utterly masterful alto saxophonist who has not only given her name to the ensemble but largely shaped its path-breaking direction, keeps reaffirmed its position as one of the finest young ensembles… all of the musicians are, as ever, completely attuned to her vision and artistry. Some recordings more than others suggest the players involved really revelled in the session, the impression left of longtime friends truly digging the tunes the leader’s given them to play. One such recording is the third release from pianist Robi Botos, a wide-ranging set featuring a crack team of high-level participants…. Throughout the set, Botos shows himself to be a multi-dimensional player, not just in the stylistic range of the recording but in his persona as a musician.